Stampin' Up! Meant to Be -Not just for Valentines! It is always nice to spread some love. 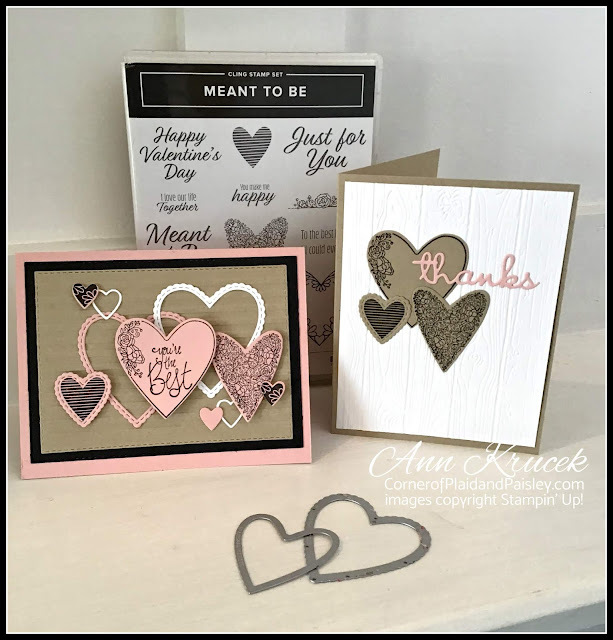 It is easy to do with the new Meant to Be bundle from the new Stampin' Up! 2019 Occasions Catalog. And just because this is considered a Valentine's day set, It can be used for many other cards such as Mother's Day, Miss You or Wedding Cards. I have also used it for a Thank you card here. Since this is a new bundle, you save 10% by purchasing the Meant to Be stamp set and the Be Mine Stitched Framelits Dies together. On all of these cards I used black ink and cardstock. 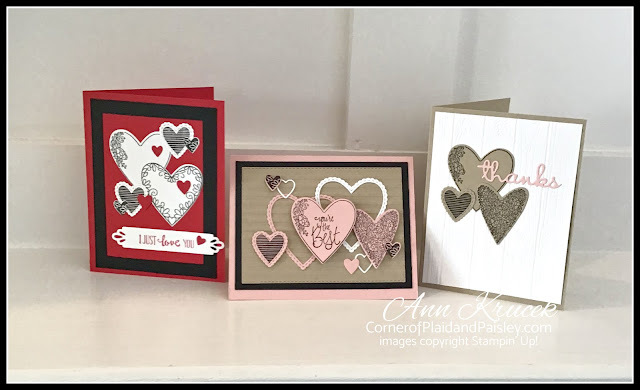 I did however use several other sentiments other than 6 sentiments it comes with just to give you some ideas on how to expand this set even more. Let's make the Thanks card! 4 1/4" , folded in half to make a basic A2 card. I cut a rectangle piece of Whisper White 5 1/4" x 4" and ran it through my Big Shot using the Pinewood Planks embossing folder giving that a nice wood texture look. Next I took my black ink and stamped out three out of the 6 heart stamps that comes with this set on Crumb Cake cardstock. Then matched them up with the framlits that fit the hearts I chose and ran them through the Big Shot to cut the hearts out. TIP: I use washi tape to line my dies up with the stamped images and run them through my Big Shot. I personally don't like using the magnetic plate with the dies - I have don't like the way the dies jump around a bit with the magnetic force!! I would rather just use the washi tape - it sticks just enough to hold it in place but not ruin you piece when you remove the tape. 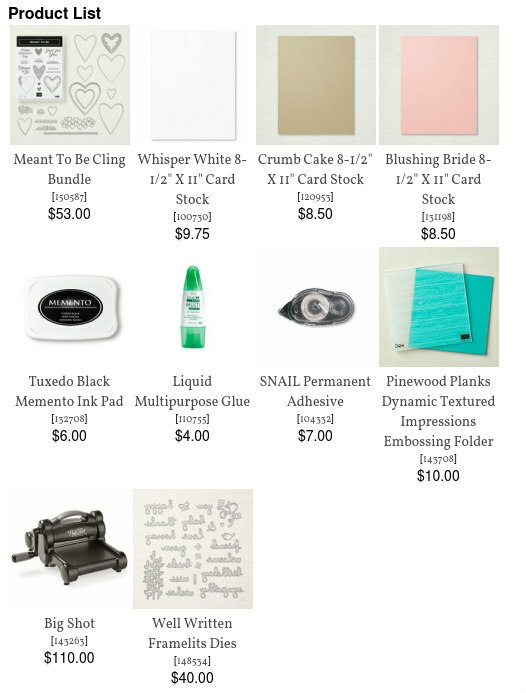 Lastly I cut the Thanks word out with the Well Written Framlits Dies (also found in the new 2019 Occasions Catalog) from Blushing Bride Cardstock, . I applied the hearts and the word Thanks with Tombow liquid glue. On the You're the Best (sentiment from the Label Me Pretty stamp set) card I used dimensionals to pop out some of the hearts, that would be an option you could do on this card as well. I also want to point out that there are a lot of framelits in the Be Mine Stitched Framelit Dies set. I only used a few on these cards. Check out how many come with it here! If you don't already have a Stampin' Up Independent Demonstrator that you work with - I would love to be your coach! You can shop 24/7 by clicking the little store front on my side bar. Please use the hostess code that is posted at the top of the side bar. If you spend more than $35.00 before shipping and tax - I will send you a sampling of the Gingham Gala 6X6 Designer Series Paper - 2 sheets of each of the 5 colors when you use my hostess code. You will also receive a copy of the Occasions Catalog and Sale-a-brations catalogs. Now is a great time to buy because of the Sale-A-BRATION event that Starts on January 3rd and runs through March 31, 2019. Free stamps and accessories are available with every $50 purchase! yes - that is on top of the DSP sample I will send if you use my hostess code! Plus you will receive free merchandise from Stampin' Up! with a purchase of $150.00 or more a long with the free stamps and accessories for Sale-a-bration!